I've always heard great things about the Doraku in Waikiki. When the newest Doraku opened up in my good friend's condominium, The Pacifica on Kapiolani, I made it a point to check it out ASAP. My best friend, Kristen, came home for a week, so we stopped by one day for Happy Hour after a hot day at the beach. I loved the décor in the place. So stylish and modern. Some tables even had a couch with pillows! We asked for any of those tables, but they were all reserved. We settled on sitting outside, which also had some comfy seats. I was worried about it getting chilly or rainy, but weather turned out to be quite nice. Of course I wanted to try everything, and Kristen was her usual, "not too hungry." I ended up just ordering everything I wanted on the menu and Kristen picked here and there. Her one request? Possible to order an ume roll? She got her wish even though our waiter said the sushi chefs are very strict about substituting things on the menu or making special items. Thank you, Doraku, for making an exception! Service? We had a great waiter, Isaac, who was attentive and funny. Also, a high school classmate of ours, Ashley, also worked there and helped us with some drinks. Parking was easy, as it's Valet only, for $5. Other than that, you can park by Kaka'ako and walk, but I suggest just forking up the $5 for Valet. Food? I loved the presentation of the food. Taste was average and pricing was high. For everything we ordered, bill came out to $80 something and around $100 with tip. I think there are better sushi places on Oahu, but the atmosphere and ambiance are very cool. 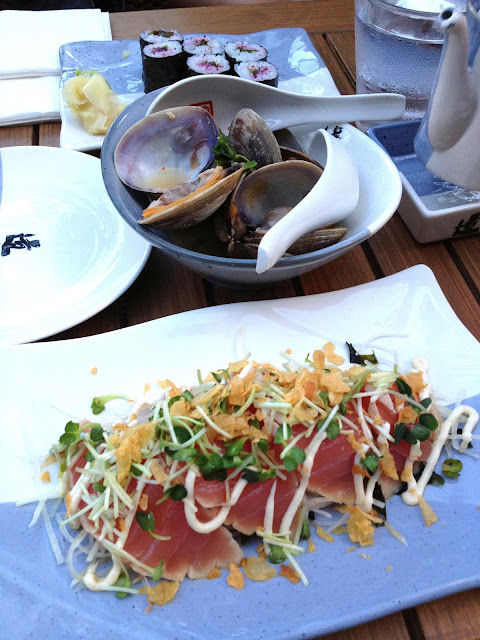 Some Happy Hour items were not memorable, except for the Tuna Tataki. What a standout food item!! And for only $5!! We had two orders of that, and could have had more. The only thing we hated? DO NOT ORDER THE MISO EDAMAME. Terrible, terrible, terrible. Isaac, our waiter, did actually warn us that the sweet and spicy miso was much less popular than the teriyaki garlic edamame, but KZ went ahead and ordered the miso. It was essentially just soybeans and miso paste. We probably ate 2-3 each and wasted the rest. We also ordered some rolls that sounded SO delicious, but were just average- Emperor Roll and the Spicy Lobster Roll. I would have loved to also try their New Style Doraku Roll with Crab and Avocado topped with daikon, shiso leaves, crispy garlic chips and finished with Wasabi Yuzu Citrus Sauce. And also their Red Dragon Roll with Spicy Tuna, Shrimp Tempura, and Avocado topped with Unagi, Red Tobiko, Unagi sauce, Ao Nori, and finished with Spicy Aioli. Next time! Other than that, I highly recommend the Momotaro Lemonade (Peach Vodka, Peach Liquer, and house made lemonade), and two of the Happy Hour items, both $5 each- Asari Clam Sakamushi and the Doraku Tuna Tataki. Small portions, but both delicious and cheap eats! If you're looking to entertain some guests (local or visiting) and want to munch on some sushi rolls while dining in style, this is your place! Very impressive. Happy Hour is everyday from 4-7pm and a late night Happy Hour from 10pm-closing. "Doraku" means "The Road to Happiness" in Japanese. DO means road/path and RAKU means happiness or pleasure. Such a pretty drink! Momotaro Lemonade. Clams Sakamushi and Tuna Tataki, Kristen's Ume Shiso in the background. 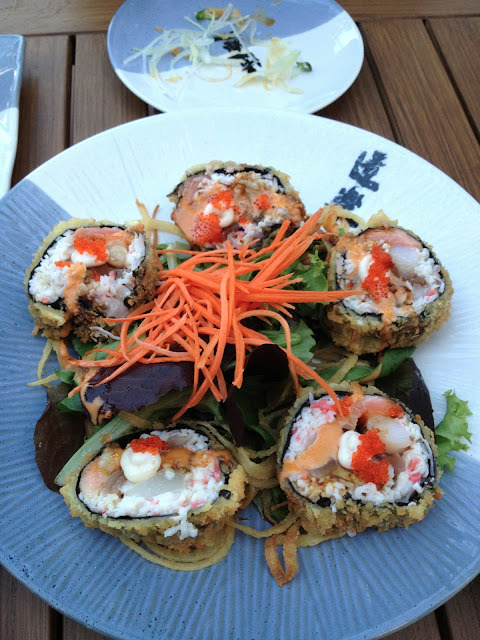 Emperor Roll- Tuna, Salmon, Crab, Shrimp, Scallop, and Avocado Roll crusted with Panko, flash-fried and served over Spring Mix with Sweet Onions, and finished with a Special Aioli Sauce and Tobiko. Spicy Lobster Roll- Lobster, Shredded Crab, and Cream Cheese, Tempura fried, served with Red and Black Tobiko and finished with a Spicy Garlic Aioli. 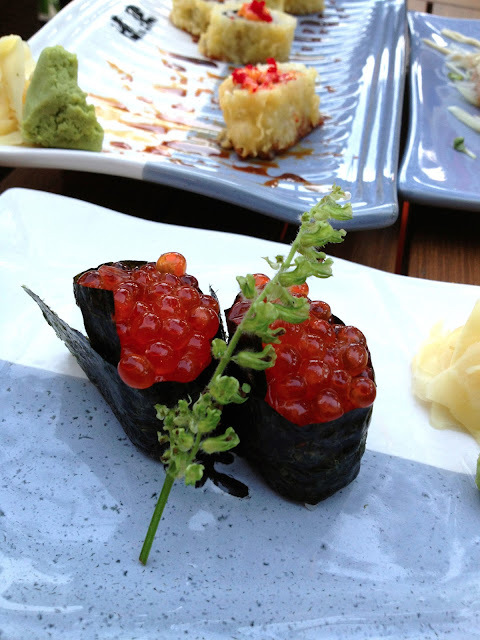 Can't go without my favorite- one order of Ikura, please! Finished with Green Tea Ice Cream, Azuki and fruit. 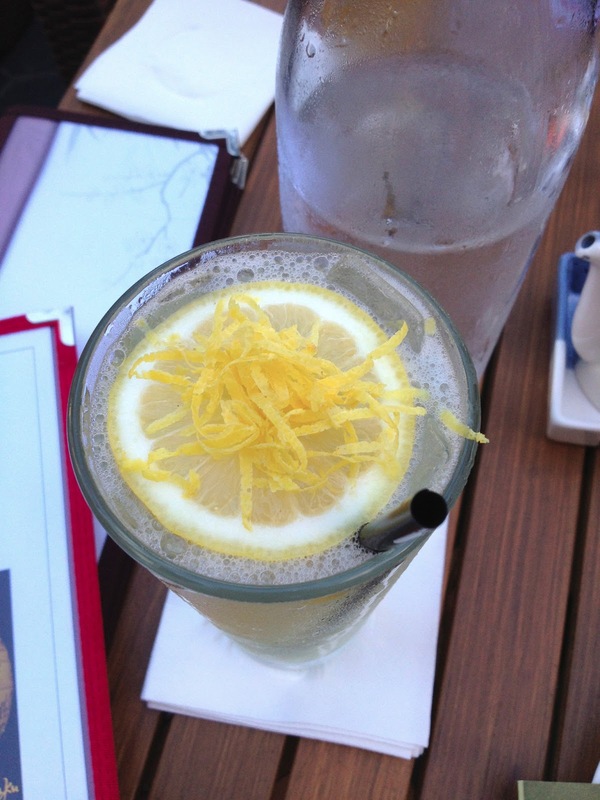 A side of Lychee Martini! whoops, this comment was supposed to be for the previous post!